The Lakewood Masonic Temple is prominently located at the western edge of downtown Lakewood at the corner of Detroit and Andrews Avenues. The original site incorporated 100 feet of frontage along Detroit Avenue, Lakewood's main thoroughfare, and 200 feet along Andrews Avenue. Additional land behind the Temple along Andrews Avenue was later acquired for parking. The Temple is constructed of Bedford limestone and was described when built as "absolutely fireproof." When completed in 1916, the building and its contents represented a value of over $150,000. While by no means as large as many similar structures, it is said to be as beautiful and complete as any. The exterior is strictly Grecian. The main architectural feature is the front porch, the roof and pediment of which are supported by four large fluted Doric columns. Every line of the structure is classical in detail, and the building is pointed out as being one of the most impressive in the city. A prominent feature of the Temple is the splendid stair hall, extending from the main floor to the upper mezzanine. The winding staircase is of white marble, with massive rail and white marble wainscoting. The Lodge Room, located on the upper floor at the top of the stair hall, is handsomely and richly decorated in an Egyptian Temple motif reflecting the era of King Solomon to which the Masonic Fraternity traces its origins. 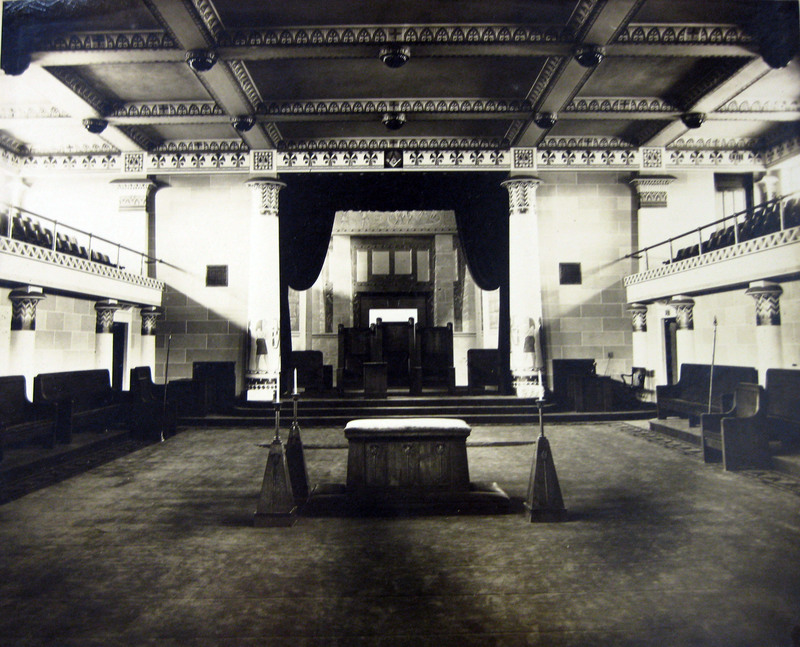 At the front of the room is a large stage containing all the lighting devices and scenery necessary to confer with impressiveness any of the Masonic degrees that are here portrayed. The balcony is unique in that it recedes from the floor rather than projecting over it. Fixed seating on the main and balcony levels will accommodate 300 persons. Additional moveable seating can be fitted. A magnificent 23 rank Votteler-Holtkamp-Sparling pipe organ dates from the building's construction and is a rare example of a tubular pneumatic organ still in its original state. The instrument was featured in a recital during the Organ Historical Society's 2009 National Convention in Cleveland. The Ballroom, located on the main floor (Detroit Avenue level), is constructed in a French Provincial decor and features a 3500 square foot hardwood dance floor that will accommodate 125 couples without crowding. Other configurations will accommodate groups up to 450 persons. The original decorations were in rose, with ivory pilasters touched with gold. The Grand Foyer is paved with marble and contains fluted pilasters in harmony with the Ballroom itself. 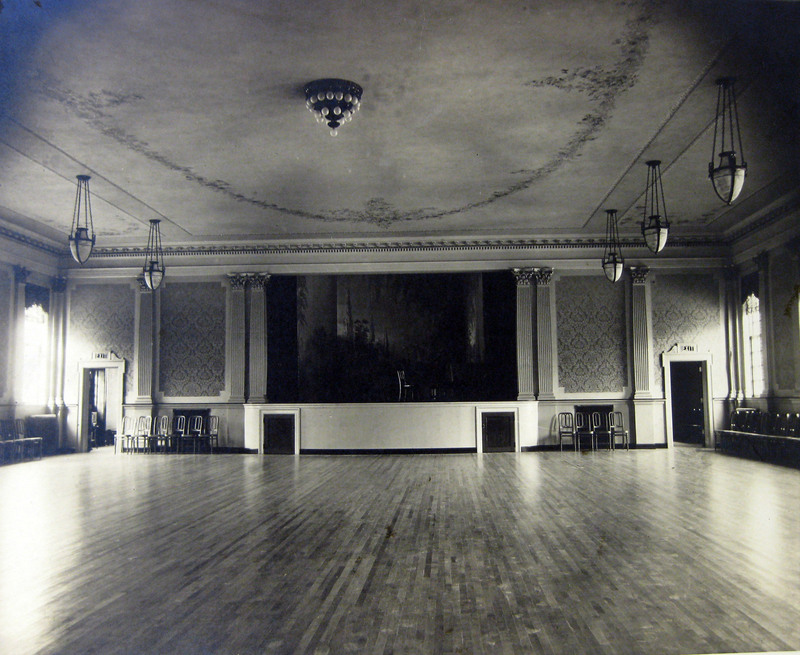 Spaces adjacent to the Grand Foyer were originally designed for men's and women's retiring rooms, coatrooms and ticket sales. 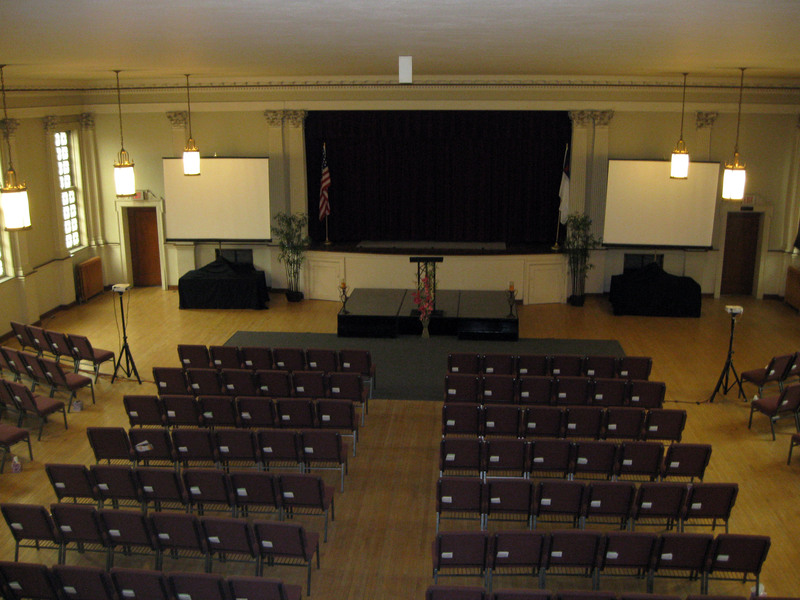 At the front of the Ballroom is a 480 square foot stage framed by a 21 foot wide by 11 foot high proscenium arch. Adjacent to the stage is a refreshment room with a small kitchenette. The 3600 square foot Banquet Room, located on the lower floor (Andrews Avenue level), can accommodate up to 270 persons for sit-down or buffet-style dining. The adjacent full commercial-style kitchen and dishwashing facilities may be used for food preparation or as a service area for an outside caterer. Below the Lodge Room floor is the First Mezzanine, the principal feature of which is the Ladies' Parlor (or Sewing Bee Room), ample in size and originally furnished for the use of the members of the Eastern Star for their social and charitable affairs. Also on this floor is the office of the Board of Trustees of the Temple Company. Above the Lodge Room floor on the Lodge Room balcony level is the Second (or Upper) Mezzanine, which principally houses offices of Masonic groups that meet in the Temple. The Armory is on the top-most floor and is accessed from the Upper Mezzanine. It was originally equipped with individual steel lockers for the uniforms of members of Holy Grail Commandery #70 Knights Templar. The space is currently used for storage.